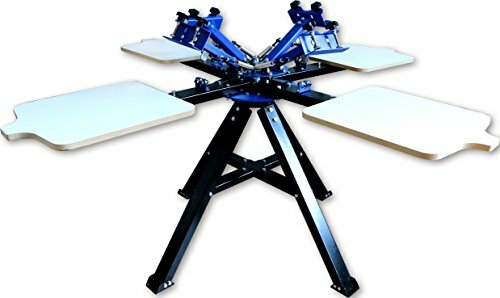 Model M442L--- 4 Color 4 Station Screen Printing Press. You can print onto clothing, woven fabric, metal, paper, copybook, plastic, circuit board, wood, glass, ceramic tile, leather and other plane printing substrates, which is especially suitable for small businesses and individual printing shop. For skillful operator, two person could print 30-50 pieces 6 color T-shirt in one hour. Pallets are fixed on the holder, the situation has been set up before selling, you don't need to adjust it. Each screen frame's fixing device is equipped with precise positioning wheel, when the positioning iron on the arm placed in positioning wheel closely, it can ensure the printing result precision . The screen layer and the pallet can rotate independently, which makes it easier for multi-color printing. This machine is manual color matching printer, only need to adjust one pallet. If one of the printer arm has finished adjusting, other corresponding position will be settle down.